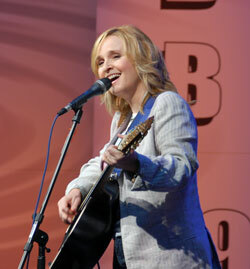 Singer/song writer Melissa Etheridge has been a hit maker for two decades with songs like “I’m the Only One,” “Like the Way I Do,” “Breathe,” and “Bring Me Some Water.” Today, she was a certified hit at the National Biodiesel Conference with her inspirational story of how her battle with breast cancer led her to want to make a difference in the world and how she believes biodiesel is helping. Etheridge was extremely gracious and generous with her time at the conference – which was not a paid gig, by the way. She not only shared her story, she also entertained with two songs – “What Happens Tomorrow” and “I Need to Wake Up,” her Oscar-winning theme song from “An Inconvenient Truth.” In addition, she took time for a press conference, individual interviews and lots of photos with fans. She started using biodiesel after a chance meeting with Willie Nelson on a plane a few years ago. That led to her starting to use biodiesel in all of her tour buses and trucks, as well as in her own personal vehicle, a Ford diesel Excursion that she fills with biodiesel in her own garage. “When I pick my kids up from school they tell me, ‘Mom we can smell you coming half way down the block,” Melissa told the crowd at the conference today. She says that when she saw the plane that safely landed on the Hudson River last month and everyone got out safely, it was a sign to her. “We are all going to get out of this alive, we’re gonna do it,” she said. 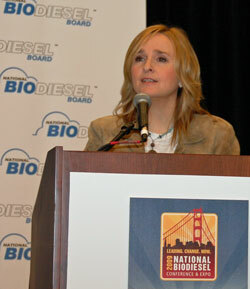 For her efforts and enthusiasm, Etheridge received this year’s Influence award from the National Biodiesel Board, presented to her by NBB CEO Joe Jobe and Daryl Hannah.